Last week I caused a mini first world storm by exposing some mismatched wine scores and vintages on social media. Read on to see why you should always check the fine print on those shiny medallions you see plastered on wine bottles. In the genuine winning wine category, I sifted through a good percentage of the massive, 160+ product December 10 release to select over a dozen, mostly premium buys, including some big-scoring old and new world classics, red, white, fortified, sweet and bubbly. You won’t go wanting for any wine style this month. Keep some room in your inbox for the annual Fizz Report coming Dec. 16th. Next week, David and the crü will share their top picks from this release. High scores and medals sell wines. In an evermore fractured world wine market, with more producers, importers, distributors and retailers than ever before, it’s no wonder why everyone along the supply chain from winery to sales rep seeks to capitalize on any commercial advantage. This includes promoting any big scores or medals their wines may have received. But you’ll want to take a closer look – things are not always as they appear. 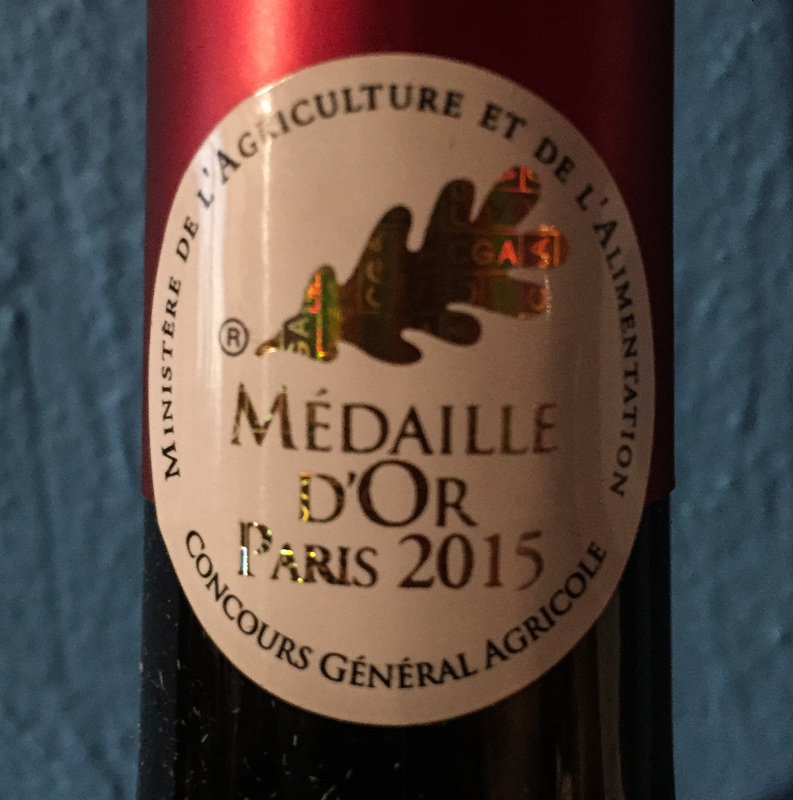 You’ve seen them before, those medallions affixed to bottles citing a gold medal at such-and-such a competition, or a prominent wine critic’s 90+ score writ large. The practice is commonplace in the business of selling wine, especially at the more commercial end of the spectrum. Cues like these help consumers make quick decisions when faced with a huge lineup of unfamiliar labels, comforted by a third party endorsement. WineAlign certainly participates in the business by publishing scores and awards, which are available to anyone to use. But let’s put aside the philosophical discussion on the credibility of a particular critic’s scores, or the methodology of a competition that makes one more reliable than another, and look at a more concrete problem: the seeming attribution of a score or a medal for a specific wine to another wine altogether. I’ve seen it often enough: a gold medal on bottle from a competition that took place before the wine it adorns was actually produced, or wines with a whole string of medals or scores, ostensibly plastered on to show a wine’s pedigree over time, but none of which, looking closely, were in fact awarded to the actual wine in the bottle. Most recently I happened to come across two particularly questionable examples back-to-back, which lead me to bring this subject up – my little shot across the bow. In each case, the bottlenecks had a loonie-sized sticker showing a 91 point score, visible at a fair distance. But it was only when I looked more closely that I noticed, in type-face about 1/10th the size, that the scores had been attributed to a earlier vintage than the one in the bottle, i.e. 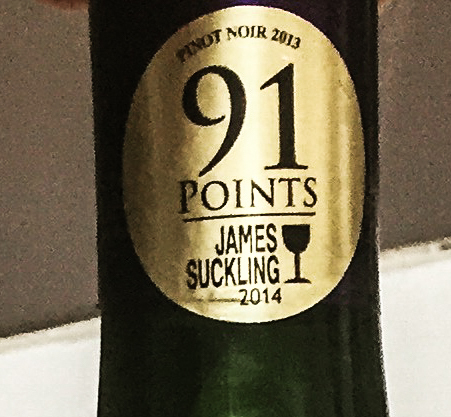 scores for the 2013 vintage on a bottle of 2014 and 2015. I can guarantee you that any customer casually perusing the aisles of the LCBO would look at either bottle and assume that the prominent score was attributed to the wine inside, as I initially did. Not so. Vintages, as we know, do matter, and a high score one year hardly guarantees equal success in another growing season. Although not technically false advertising, since the vintage that was reviewed is printed on the sticker in both cases, I find the practice dodgy to say the least, and willfully deceptive at worst. It’s hardly a matter of national security. 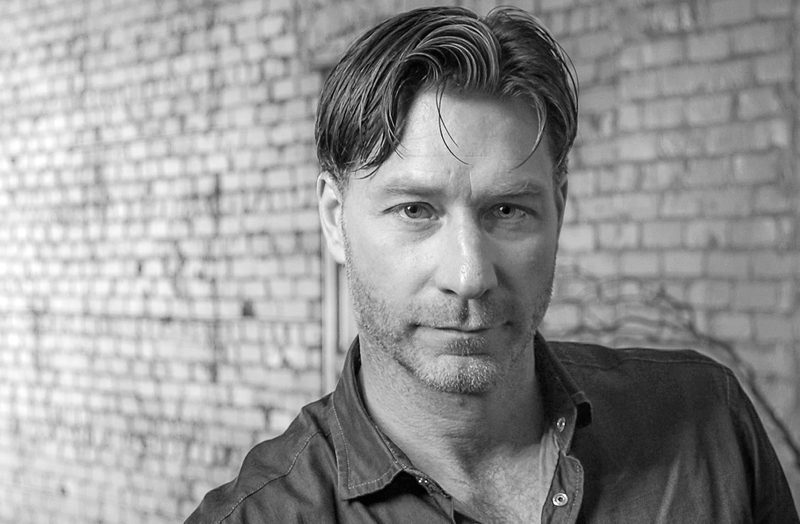 But not only does it potentially compromise the integrity and reputation of the critic or the wine competition in question, it undermines, when noticed, consumer confidence in the whole system. That’s ironically counterproductive to using scores to sell wine in first place. It also seems to imply that the vintage in the bottle is inferior to the one that received the favourable score. Otherwise, why wouldn’t one affix the score for the current vintage? Again, it’s counterproductive. The hope, I suppose, is that no one will notice the fine print. Just because the current vintage wasn’t reviewed yet, or the stickers didn’t arrive in time for shipping, is hardly justification for using an old, irrelevant score, especially when it’s made to look like it applies to the current wine. And whether the stickers are applied at the winery, or by the agent in country after the wine lands, it’s still wrong. I hadn’t intended to turn this into a crusade, but I did post photos of these stickers on my personal facebook/instagram/twitter accounts (November 23rd), drawing attention to the potentially misleading nature of the scores. After all, I work for wine consumers, and I thought you might like to know. The posting, let’s say, caused some interesting reactions, ranging from sympathetic to some degree for the plight of producers/importers dealing with long LCBO delays between ordering and shipping, to downright outrage by people who felt they we’re being duped. The most vehement reaction came from the importer of one of the brands, who sent a swift letter directly to WineAlign (not me) stating that they would never advertise with WineAlign again. So much for the high road. I guess he thought I was supposed to be working for his brand, not the consumer. The importer of the other brand, Alex Patinios of Dionysus Imports, had the professionalism to call me directly and attempt to explain the situation, which, as it turns out, was apparently an administrative bungle. He is working with the supplier to ensure that such errors don’t happen again in order to protect both the integrity of his company and the brands he represents. It’s the right thing to do. In large operations like the one in question, Patinios explains, work orders are drawn up for specific shipments. Orders are bottled on demand since often each market has different labeling requirements, preference for screwcap vs. cork, back label language, etc., as well as other special market-specific bottle dressings like a score or medal sticker. In this case, I was told, the original LCBO order was for the same vintage as was rated on the sticker. But because of shipping delays, a later vintage had to be sent. 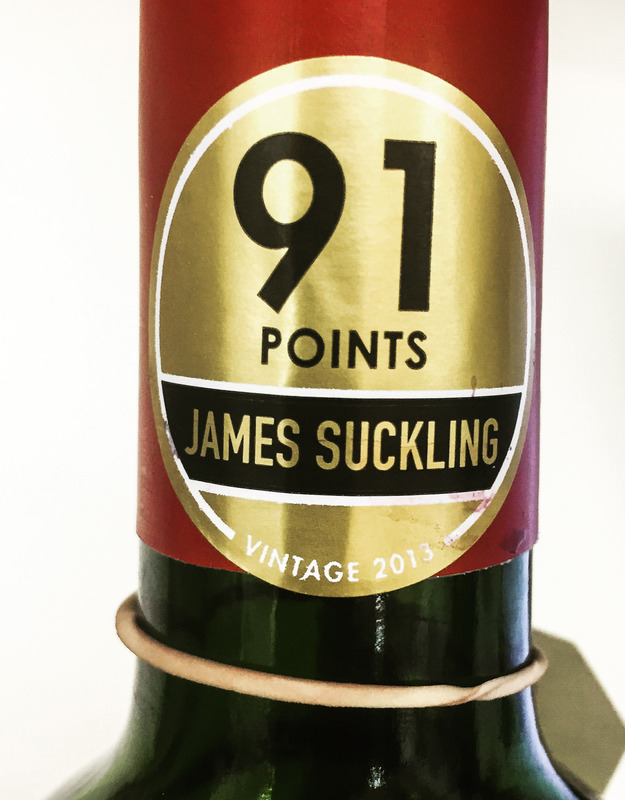 The work order was changed to reflect the new vintage, but the order to add that 91-point sticker, awarded to the previous vintage, was mistakenly not. So, the bottling line was fired up and workers followed the work order without question. That’s definitely a step in the right direction. But for now, the bottom line remains the same: buyer beware. Don’t assume that shiny medal or big score applies to the wine inside – remember to check the fine print. Hopefully the numbers add up. I’d love to hear your thoughts on the matter. As Tomney says, “We would encourage you to please bring any examples to our attention, as this is a matter LCBO takes very seriously”. So, have you come across anything misleading? Drop me a line in the comments section and I’ll pass it along. In the meantime, let’s get on to the bona fide top scoring wines and best values from the December 10th VINTAGES Release. I’ve enthused about this estate on the north side of Montalcino before, but the Caparzo 2011 Brunello di Montalcino, Tuscany ($46.95) is particularly worthy of recognition. After a riper and more wood-inflected, less distinctive 2010, the 2011 is fully back en form. It’s such a lovely wine, fragrant, pure, balanced and polished, while still retaining that lovely savoury-floral sangiovese character. Tannins are smooth and acids are balanced, making this a wine for the short or mid-term I suspect, but it will be a wine of great hedonistic pleasure in the meantime. Best 2016-2023. Fans of classic nebbiolo will find happiness in the Giacosa 2011 Vigna Mandorlo Barolo, Piedmont ($53.95). From the Scarrone sub-parcel in the Mandorlo vineyard in Castiglione Falletto, this is only just starting to enter into a fine stage of drinking, with a fully engaging set of aromas ranging from sweet, ripe red fruit to violet-rose perfume and gentle old wood spice from ageing in 3000l casks. The palate is perfectly mid-weight, firm and gritty, like raw silk, with the typical elegant austerity of wines from this commune, as well as that extra dimension of depth and flavour that’s found only in top wine with genuine density and concentration. Drink, or better yet, hold another 3-5 years for the full umami experience. Best 2018-2030. Tenuta Frescobaldi di Castiglioni 2013, Tuscany ($47.95 / 1500mL). Having a party? This reasonably priced magnum from the Frescobaldi stable would fit the bill nicely at any gathering where serious punters and occasional imbibers are drinking side by side. It’s a blend of sangiovese and cabernet done up in a modern, approachable style, full of ripe, dark fruit flavours and an appealing lashing of wood-spice. Nice depth and length, too. Note that the 750ml bottle sells for $21.95, but that’s not as much fun as a magnum. Another decidedly old world red gem is the Señorío de P. Peciña 2009 Reserva, Rioja ($29.95). It’s evidently concentrated with significant ripe, lightly dried, red fruit extract, and abundant tannins, well polished yet structure-giving. There’s loads of authentic and genuine wine in this bottle. Drink, or better yet hold another 3-5 for the full savoury-umami experience. Best 2016-2029. The surprise of the release was the Chateau Ste. Michelle 2012 Cold Creek Vineyard Cabernet Sauvignon, Columbia Valley, Washington ($42.95). Admittedly most of the wines I’ve tasted from this large company have left me nonplussed, but this single vineyard cabernet from 45 year-old vines, one of three superior sites singled out by the winery, is genuinely impressive. It’s intensely perfumed and flavoured, sumptuous and ripe, with loads of cassis and black cherry flavour, generously but not excessively oaked, full-bodied and richly satisfying. Consider it a wine for those cold winter nights when braises or stews hit the table. Cellar this comfortably into the early-mid-twenties. From high up in the Mayacamas range, the Stonestreet 2013 Cabernet Sauvignon Alexander Valley, Sonoma County, California ($53.95) is a true “mountain” wine, bold and intense. I like the density and the tightly wound texture, the concentration and the dark fruit and spice flavours, with fine harmony all around. Wood is a support, not a dominant force. Meaty and satisfying. Best 2018-2025. A perennial South American favourite, the Emiliana 2012 Coyam, Colchagua Valley, Chile ($29.95), delivers the expected balance and succulent acids on both a satisfyingly, deep, dark fruit and pleasantly herbal backdrop. A six-variety blend led by syrah and carmèrene, certified organic (like all of Emiliana’s wines), this is the company’s flagship wine and fine value in the premium context. Best 2016-2024. And finally, premium Bordeaux-style reds from the 2012 Niagara vintage are starting to come into their own, as shown by both the Henry of Pelham Estate Cabernet/Merlot, VQA Short Hills Bench ($24.95), and the Château des Charmes 2012 Old Vines Cabernet/Merlot, VQA Niagara-on-the-Lake Ontario ($21.95). Both have shifted into a fine stage of evolution between fruit and more earthy/savoury/evolved character, though neither shows any signs of tiring yet. Tannins are shaping up nicely, still lightly grippy, so decant and serve with salty protein, or cellar another half dozen years. It’s true that you often pay more for rosé champagne because of its scarcity rather than intrinsic quality, but an exception is the excellent Moutard Père et Fils Rosé de Cuvaison Brut Champagne AC ($49.95), from the Côte des Bar in southern Champagne. Not only is it fairly priced, it’s also rendered in a style I particularly appreciate, made with skin contact to extract a light amount of colour as opposed to getting its pink shade by adding a spoonful of red wine along with the dosage after disgorging, as most rosés are. The result is a more structured, earthy, serious wine, almost like pinot noir with bubbles, earthy, autumnal, and floral, also fruity, though that’s not the main driving force. I’d put this in the category of champagnes for the table – it would be spectacular along side some duck prosciutto or veal scaloppini, for example. Cloudy Bay may be most famous for sauvignon blanc, but the Cloudy Bay 2014 Chardonnay, Marlborough ($36.95) is a beauty. It has an attractive dose of flinty-smokiness on the nose, and a sharply defined, succulent and juicy palate, very lengthy, with great complexity. I love the citrus-driven complexity. Best 2018-2024. An ideal house wine for upcoming parties is the Amaral Sauvignon Blanc, Leyda Valley, Chile ($14.95). It’s very crisp, fresh and pungent in the classic cool climate sauvignon style, essentially dry and zesty but also with a fine measure of flesh and generous alcohol (13.5% declared), softening the acid impact and widening the appeal. And at the price you can’t go too far wrong. I’m hoping that this is the time of year where I might be able to convince you to give sherry (another) try. I’m talking about the real, intensely flavoured, dry styles that rank among the most complex wines in the world for the money. Doubters should pick up the El Maestro Sierra 12-Year-Old Amontillado, Jerez-Xérès-Sherry ($27.95), a lovely old amontillado, fully in the classic flavour register between fino and oloroso, which is to say still yeasty and doughy, but with some engaging maple syrup and light caramel flavours. Just check out the wonderful concentration and the exceptional length for the money – not much can compete with this. And for a versatile sweet wine that can move from the cheese course into dessert or after dinner sipping, check out the well-priced Puklus Pincészet 2012 3 Puttonyos Tokaji Aszú, Tokaj-Hegyalja, Hungary ($20.95/500ml). “3 Puttonyos” refers to the level of sweetness on the now-obsolete scale that ran from three, the driest, to six, the sweetest aszús. That still puts this in the medium-sweet category (somewhere around 80 grams of residual sugar per litre), fruity and easy-drinking, with authentic regional character including lots of clean botrytis/dried berry flavour. Within the context of botrytis affected wines specifically, this performs very well with great pricing. A fine by-the-glass option for restaurants or home parties. Best 2016-2022. That’s all for this week. Look for my annual Fizz Report on December 16th listing the top sparkling wines in all price and style categories to drink over the holidays, and a round up of Ontario’s best wines with oysters – now is the perfect time of year to be enjoying Canada’s finest bi-valves.